Ladbrokes Bingo have been handing out free turkeys this festive period, although we are not talking about the real kind – as it is toy turkeys they had in mind. This is a free gift offer from Ladbrokes Bingo and it is on top of their already super free £50 welcome bonus deal, although just what you would do with a toy turkey we don’t know – give it to the kids to play with or even your pet dog (if you have one that is)? The free toy turkey giveaway is only available for a limited time, and it will run up until 16th December or until their stocks run out. To claim yours and that free fifty pound bonus, you simply need to register with Ladbrokes Bingo, make a first deposit of just £10 and play through this amount purchasing bingo tickets. Once you have meet this requirement they will automatically place the free £50 in your account and your toy turkey will be on it way to your door very soon too (subject to stock). Laddies festive fortnight kicked off yesterday (Monday 12th December) and this is set to take place over 14 days. Laddies has his own way of starting the Christmas countdown and lets just say he has lined up lots of festive themed games for you to take part in, and something different will be going on every single day. Today, 13th December you could win a yummy Christmas hamper, tomorrow we would advise you to check your emails as a select few will receive an email from them which will contain a 100% bonus code inside. To see just what else they have lined up simply head to their site and check out their promos page – there is bound to be something you fancy on here! This entry was posted in Bingo Blog and tagged Ladbrokes Bingo on December 13, 2011 by Emma. It looks like Ladbrokes Bingo are set to reward you in more ways than one this month and they are starting things off by keeping their super deposit £10 get £50 free sign up deal for November. Ladbrokes Bingo have just opened a brand new loyalty rewards scheme at their site, where you will now be rewarded for simply playing the games you love and to celebrate (laddies rewards) they are bringing you the chance to win a share of 20,000 points. The 20,000 laddies rewards points promotion will be running at Ladbrokes between today and 30th November. Points mean bonus funds and even withdrawal real cash prizes at Ladbrokes, so they are well worth clocking up and 20k of them would certainly kick start you point bonus balance that is for sure. How can you get in this fab prize draw? Well it is pretty simple really and this is how it works. 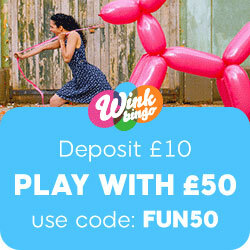 During the above promotional period you need to spend through either £50 playing bingo or £100 playing mini games / slots (in the same day at their site). This will give you one entry into their 20,000 ladies reward points prize draw. You can qualify for two entries though if you spend on bingo and mini games. Please note: Mini roulette, crystal balls and blackjack are excluded from this offer. Check out just how those 20,000 laddies reward points will be dished out. If you are a registered Ladbrokes Bingo player you will now automatically earn laddies points each time you play on their games. Each time you spend £1 on bingo you will earn 1 point and for every £10 you spend on mini games you will also earn 1 point. You can view your points balance at anytime by going to the (account) area once you are logged in. This entry was posted in Bingo Blog and tagged Ladbrokes Bingo on November 1, 2011 by Emma. The £50 free new player Ladbrokes Bingo bonus continues once again this month, which is great news if you have not yet checked them out for yourself. It could not be easier to get your hands on the great £50 free bonus at Ladbrokes Bingo either – here is all the info you need. Simply register with them today, make a first deposit of just £10 and play through this amount purchasing bingo tickets. Once you have met this requirement Ladbrokes will automatically place the free £50 into your account, could it be any easier than that? There is something extra special about this free bonus that you may not be aware off – as there are basically no wagering requirements attached to it! So whilst the free bonus cannot be withdrawn from your account, any wins derived from it can without having to meet any strict wagering rules. If a bingo site on the net gives you any sort of bonus, you can usually guarantee that they will come with some sort of wagering requirement attached and these can be really high in some cases, which is why we would always recommend checking out the finer details of these offers before commencing play. At Ladbrokes Bingo though you don’t have to worry, which makes their sign up deal one of the best around at the moment – really, it just cannot be beaten. You can use the £50 free bonus funds to purchase bingo tickets in any of their rooms and you certainly have a great selection of games to try out. If you find getting 1tg frustrating, try out laddies lucky loft, as you won’t be getting up tight about it any more. Penny bingo is also available to play here, so that free £50 could go a very long way. This entry was posted in Bingo Blog and tagged Ladbrokes Bingo on October 11, 2011 by Emma. You can log onto Ladbrokes Bingo and grab a massive £50 bonus right now, but this great offer will not be around forever. The huge free bonus from Ladbrokes Bingo is currently one of the very best sign up offers around and the best bit is there are no wagering requirements attached to it. So whilst you would not be able to withdraw this free bonus cash, any wins derived from it can be withdrawn, which really does make this a great free play bingo deal. We have seen some astronomical wagering requirements placed on bonus cash handed out by bingo sites in the past, so to see an offer like this where there are basically none – makes it stand out from the bingo crowd. To get your hands on this fifty pound free bonus you simply need to register at their site and make a first deposit of £10. Play through you initial deposit amount purchasing bingo tickets and Ladbrokes will automatically credit your account with £50. You can purchase bingo tickets from just 1p, so that tenner would go a very long way on its own, never mind all that free bonus cash they are throwing in as well. They are a well known and trusted name within the industry. The only area they seem to lack in a little bit is the (promotions) side, as their promos do fall behind some other sites on the net (there just is not enough of them on Ladbrokes and their promo deals can be sparse, compared to promos elsewhere). But their bingo game play does make up for this somewhat, as there is just so much bingo gaming choice here, they even have their own exclusive bingo like laddies lucky loft, where getting 1tg might just not be such of a pain after all. This entry was posted in Bingo Blog and tagged Ladbrokes Bingo on September 27, 2011 by Emma.